This article isn’t just about filling out all the fields on your Google My Business profile. It isn’t just about making your profile “nice and pretty” so that people want to click on it and book. 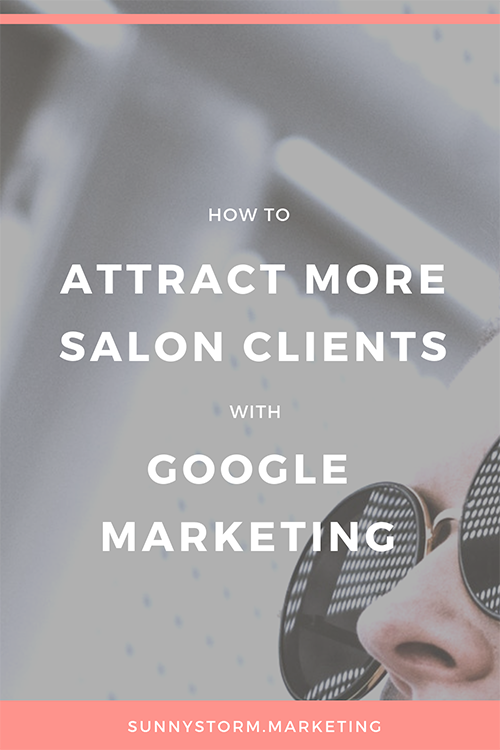 It’s not about how to “game the system” and make Google think your salon is the best in town. This article is about how your salon’s internet presence is connected to the core of your business. How people search for information online is becoming CRITICAL for your salon to understand. And how people search online nowadays is Google. Needless to say, your salon needs to take Google My Business seriously! How can my salon’s Google My Business listing rank first? Have you ever searched for beauty businesses nearby and been frustrated that other salons show up higher than you on Google Maps? What does your salon need to do to show up first? Before you get frustrated and give up, it’s really important to understand how Google ranks businesses, so you can work on moving up to first place. But just to be clear, in this article I’m talking about improving your salon’s ranking on Local Pack/Maps search. How your website ranks is completely different, and you can learn more SEO for your salon website here. The first is how your salon’s GMB profile is actually optimized - which is exactly what we’re going to talk about in this article - and how close the searcher physically is to your location. The second factor is Link Signals - which are links from other websites that point to your salon’s website (not your GMB profile). To learn more about improving your website, check out my article here. Reviews help a lot, and I’ll give you some ideas about how to get more 5 star reviews in this blog post as well. There are several other ranking factors that affect where you appear on Google, but for today we’re going to go through number 1 and number 3. It’s clear that optimizing your GMB profile is the most important thing you can do to get your salon found on Google, so let’s jump in to exactly how you can do that! Most of you have probably already done this step, but I’m putting it in here incase you’ve skipped it. When you claim and verify your profile, you’re telling Google that you do in fact own your business, that you are at that address, and that is your contact information. Once you’ve done this, you can add photos and info to your listing, respond to reviews, and connect to your website (which is a really important part of your SEO strategy). If you find that you haven’t got a listing already, log into Google My Business or create your account here. Follow the steps to create a new listing and choose a verification option. You can find full instructions from Google here. One last reminder: be SURE that there is only ONE Google My Business listing for your location. If you have an old one, or if there was another salon/business with the same address that still exists, it will hurt your ranking. To remove old or duplicate GMB listings, follow these steps from Google. Your salon’s Google My Business listing will show up when people search your business name, when they search for beauty businesses near them, or when they look at your business on Google Maps. It’s important for providing a great first impression with all the most important info front and centre. Let’s make sure that your listing is complete! Your business name: make sure it is spelled exactly as on your signage, logo, and stationary. Don’t add keywords, city name, or anything extra to your Business Name unless it’s your real, legal name. Your correct address: Make sure that it’s spelled and formatted exactly the same as on your website. If you’re mobile, you can also add a list of services areas you go to by ZIP code. I can’t stress enough how important it is for ALL of this information to be consistent across Google My Business, your social profiles, on your website, and anywhere your salon appears online. And when I say consistent, I mean EXACT. Your name spelling, address, and phone number should match word for word, letter for letter. If there are any inconsistencies, your SEO ranking can be hurt in a huge way. So take a minute now and double check all of your profiles to make sure they are matching! You can choose up to 9 categories for your business, but you need to choose a single “primary” category. Make your primary category as specific as possible. For example, if you do nails, select “Nail salon” instead of “salon”. Once you’ve chosen your main category, you should choose additional categories to describe the other services you offer (if you have more than one service). For example, if you’re primarily a nail salon, but you also do spray tanning, you can add “tanning salon” as a secondary category. Remember, Google decides whether to show your listing primarily based on your category, so make sure it’s the right one! Next, write an short, attractive description of your business. It should be friendly, concise, and descriptive of what your business does, and maybe even a bit about you. Think of it as a single paragraph to “sell” your services and what makes your special or unique. You have 750 characters of space, but the description gets cut off after 250 in some places, so be sure to keep the most important info at the beginning! DO include a few keywords (like “microblading”, “lash extensions”, "acrylic nails” etc) near the beginning of your description, in a flowing sentence. All of these photos will give people a great idea of your style and salon culture, and I guarantee you will get a ton of views. Just make sure that the photos are high quality and bright! Low-quality photos that are dark and grainy could do more harm than good. When saving and naming your photos on your computer, try to save them with file names that are optimized for SEO, as Google may take those into ranking your profile. For example, instead of naming your photo “IMG_1540”, name it “stephanie-salon-lash-bar”. You can even add a video to your listing! And this is something that I really recommend. If you’ve already filmed a tour video or have a nice promo video you’ve done for Facebook, include it in your listing - it’ll catch a lot of interest! If you want some ideas for making salon videos, check out my blog post here. One of the great things about your GMB listing is that clients can quickly book an appointment without going through your website. This is perfect for returning clients or people who already know they want to book with you, as it simplifies things and reduces “drop-offs”. To add a “booking/make appointment” button on your GMB profile, you have to use a supported booking app such as Genbook, Booksy, or MyTime. You can see a full list of integrated apps here. If your salon uses one of these booking apps and you want to link it to your listing, log into your GMB account, click “bookings” and follow the instructions there. If you don’t use one of the supported booking apps, don’t worry! Google lets you add a menu of services directly to your profile with a link to book on your website! Some salon owners don’t feel comfortable putting their pricing out there without having someone visit their website first, and that is completely understandable. If you prefer to direct people to your website’s booking page instead of adding your menu of services, you can do that too. You just need to add a link to your appointments page under your URLs. You can create updates that appear on Google for your listing! If you have any events, promotions, or news to share that you want to show up when people Google your salon (another way to get exposure for what’s new!) you can post them from inside your GMB account. Questions and answers is such an important part of your profile. Keep an eye on them and answer them frequently, because if you don’t, you’ll look unresponsive and unfriendly, and you might have other people answer questions for you with the wrong info, which you definitely don’t want! Check on your profile every few weeks and reply back to your questions to keep your clients informed. Now that you’re done optimizing your listing, make it work for you: Get reviews! As I said at the beginning of this post, your Google My Business listing is so important for your salon SEO. If you have an optimized profile, that’s a great start. But getting Google Reviews is also a huge part of ranking high in Google or in Google Maps when someone searches “salon near me” for example. They also are a extremely important part of social proof, and will encourage more people to check out your business and become clients. So, how can your salon get more reviews on Google? First… just ask! It may seem simple, but 68% of people will leave a review if you ask them! That’s amazing. While Yelp does not want you to ask clients for reviews, Google has no problem with it, as long as you don’t offer something in return for reviews (like cash, free services, products etc). Send a followup email to your clients after appointments, asking how their service went and asking if they’d be kind enough to review you on Google. Include a link to your listing. Also, the more you share reviews, the more reviews you’re likely to get! Have a dedicated section on your website for client reviews, and link it your your GMB profile. You can also have a section for reviews on your homepage, and include a link to your listing. Finally, be responsive to your Google reviews. You can and should reply to each and every review - good or bad. Being responsive shows other people that you’re active, and makes them more likely to rate you as well. Optimizing your Google My Business profile is a salon marketing idea that is guaranteed to attract searchers and bring in new clients. Google is the #1 way that people search for beauty businesses in your city, and you want to make sure that you stand out and provide info that makes it easy to book an appointment. By following the steps in this blog post, I know that you’re well on your way to bringing in new clients and improving your salon’s online presence.